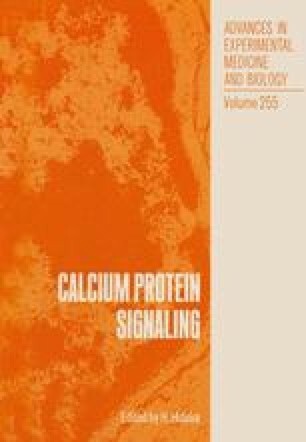 Among various Ca2+ -binding proteins, calmodulin (CaM) and troponin C (Tn C) or troponin (Tn) are well established as Ca2+ -receptor proteins which transmit intracellular Ca2+ -signaling, resulting in regulation of Ca2+ -dependent reactions. While Ca2+ -binding to these Ca2+ -receptor proteins can be considered non-cooperative, the resulting reactions show steep Ca2+ — dependence and high positive cooperativity.1 This would indicate that those Ca2+ -receptor proteins incorporated into the complex might show positive cooperative Ca2+ -binding. In this paper, we will discuss whether the non-cooperative Ca2+ -binding can explain the steep Ca2+ -dependent reactions. Since Ebashi and Ogawa1 have already explained a relevant matter with the CaM-system in detail, only an outline of that discussion will be given here, and then we will focus on the troponinsystem, i.e., the relation between Ca2+ -binding and tension by striated muscle fibers. We would like to point out that the Ca2+ -signaling is a change of intracellular Ca2+ from sub-/μM (e.g., 0.1 μ M) to μM order in the presence of mM order Mg 2+ (1 mM is assumed to be the intracellular Mg2+ concentration).